If a banker approaches the CEO of a Master Limited Partnership (MLP) with an offer to help, the CEO should run (not walk) in the other direction. The latest victim is the management of Columbia Pipeline Group Inc (CPGX). A month ago management had indicated that they’d be tapping the markets for equity via their MLP, Columbia Pipeline Partners (CPPL). This is how it’s meant to work, with CPGX as the General Partner (GP) directing the MLP it controls to raise capital and invest it, sending half the free cashflow up to CPGX via the Incentive Distribution Rights (IDRs). They currently have $8BN in projects, notwithstanding the market’s current skepticism about MLP growth prospects. To reuse the hedge fund analogy, CPGX is the hedge fund manager (i.e. earning a share of the profits and providing management) and CPPL is the hedge fund (i.e. doing as directed by the GP). But a month later, no doubt advised by its self-serving equity underwriters Goldman Sachs and Credit Suisse, CPGX instead issued equity, thereby raising capital at the GP level rather than the MLP level. “Hedge fund manager dilutes itself by issuing equity” is not a headline as commonly viewed as “Investors pile into hedge fund”. In this case, CPGX acted as the former when they ought to know better. 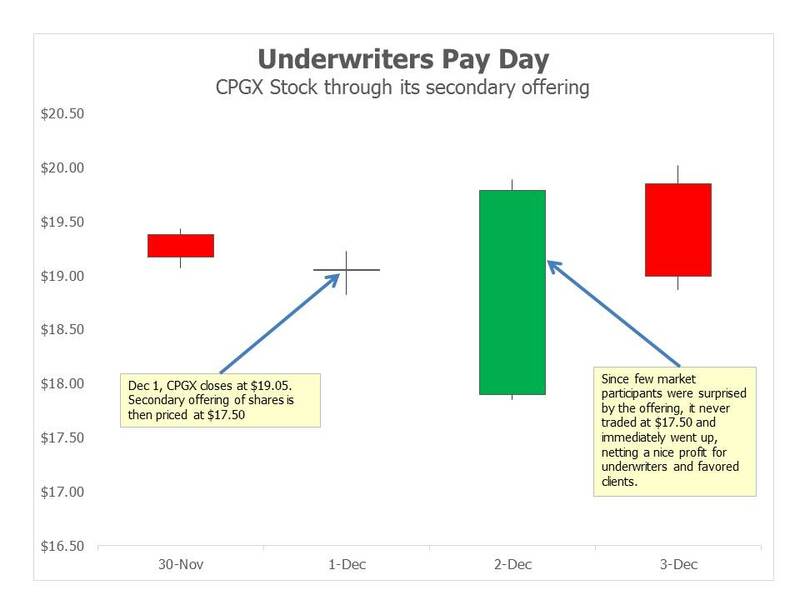 Goldman and Credit Suisse did what they do well, which is to ensure that CPGX stock traded down until the moment of pricing, ensuring a profit for the underwriters and favored clients at the expense of existing CPGX investors. The offering was priced at $17.50 on December 1, an 8% discount to the prior day’s close and a level at which it had never previously traded. Due to strong demand the offering was upsized from 51M shares to 71.5 and the stock quickly traded up while the underwriters exercised their option to buy an additional 10.725 million shares (upsized from 7.65 million shares) on top of the 71 million originally sold. Clearly, the market was not surprised; the circumstantial evidence points strongly to the underwriters alerting clients to the offering in the preceding days and thereby softening the market. This is because only the underwriters had both the advance knowledge of the offering and the incentive to see the stock trade off in the days prior to pricing. Perhaps the equity capital markets staff use hand signals to alert their colleagues on the other side of the Chinese wall about what’s coming, so as to avoid leaving any evidence of their communication. In any event, the result was a success for all involved, except regrettably for CPGX investors whose shares were valued as high as $22 just a month earlier. Make that another win for Wall Street bankers. My book Wall Street Potholes will soon need a Volume 2. You can never be too cynical. I reviewed several corporate finance blunders a few weeks ago in Investment Bankers Are Not Helping MLPs. Kinder Morgan (KMI) was part of that with their poorly handled offer of mandatory convertible securities. But on reflection, they may have committed the biggest blunder of all last year with their restructuring in August 2014. It looked clever at the time, and to our subsequent regret we liked it (see Valuing Kinder Morgan in Its new Structure). By acquiring their MLPs, Kinder Morgan Partners (KMP) and El Paso (EP), they were able to revalue their assets to current market prices and thereby create a higher tax-deductible depreciation charge that fueled a faster growth rate in their dividend. It was pretty slick. But in hindsight, the reasons for the restructuring were a warning. At their size, they were unable to finance enough accretive projects to continue growing their dividend at its previous rate. The hedge fund analogy is useful here, because almost every hedge fund eventually gets too big. KMI, the GP of two MLPs and in effect the hedge fund manager, should have accepted that slower growth was inevitable and been satisfied with 1) a recurring 6.8% distribution yield growing modestly at KMP, effectively its hedge fund, or 2) consolidating and financing growth from retained earnings like all the other large C-corps. Instead, they adopted a structure yielding 5% with 10% projected growth fueled by the higher depreciation charge but reliant on equity markets to provide capital to finance part of their growth. Fifteen months and a more than 50% drop later, they now have a 12% yielding security with 6-10% 2016 growth and questions swirl about their ability to finance accretive projects given that their cost of equity has doubled. Moreover, it’s no longer an MLP, and the pool of potential investors, while large, looks beyond distributable cashflow and distribution yield and to other metrics such as Enterprise Value/EBITDA, against which it didn’t look quite so cheap at the time. It’s no doubt a better investment today than it was in August 2014, and it remains a modest holding of ours although substantially less than in the past as we’ve switched into more attractive names. But the MLP-GP structure, with its close comparison to the hedge fund-hedge fund manager, is how Rich Kinder became a billionaire. Incentive distribution rights, the mechanism by which KMI earned roughly half the free cashflow from KMP and (more recently) EP, are similar to a hedge fund manager’s 20% incentive fee. Rich Kinder was smart enough to figure that out, but not smart enough to recognize when it’s time to stop accessing the secondary market for financing. The largest MLP, Enterprise Products (EPD), funds its growth from internally generated cashflow rather than issuing equity and has 1.3x coverage on its distribution. Perhaps that’s why EPD unitholders have fared better. Size is the enemy of performance in hedge funds and, at times, in MLPs. Shame on Rich Kinder for not realizing it and instead letting the investment bankers talk him into the value destroying structure. He bet faster growth would drive down the yield on KMI, making it an acquisition currency of less leveraged businesses in a downturn, which would in turn reduce KMI’s leverage. The strategy has backfired. KMI no longer gets credit for the dividend, which leads to questions about its sustainability. While it’s covered by cashflow and they don’t need to issue new equity until 2H16 since doing the mandatory convertible, if KMI still yields >10% in late 2016 it’ll make more sense for them to cut the dividend and thereby reduce or eliminate their need for additional equity. KMI has made the mistake of many hedge fund managers and investors, thinking they can grow indefinitely. Although some commentators are worried about pressure on pipeline tariffs from stressed E&P companies, there’s a stronger case for tariff increases since the cost of equity for pipeline owners (i.e. MLPs) has risen. Hedge fund managers don’t buy their hedge funds, and MLP GPs shouldn’t buy their MLPs. Management at Targa Resources (TRGP) should take note (see Targa Resources Needs an Activist). We are invested in CPGX, EPD, KMI and TRGP. If you stop to think about it there are several analogies for the Fed’s “tapering”, under which they gradually relax the support which has been underpinning the bond market. Maybe it’s the parent who creeps out of the young child’s bedroom at night believing they’re finally asleep, only to be halted by renewed cries from the little one. Maybe it’s Jenga, a game played with wooden blocks where players alternate turns of removing one without causing the structure to collapse. Or perhaps the magician who dramatically whips the tablecloth smartly off the table while leaving the place settings unmoved. Whatever imagery does it for you, somewhere within the investment horizon of most people the Fed will make their move. Which is why a Bloomberg article on Bridgewater’s $80BN All Weather fund caught my attention earlier today. It seems that in recent weeks Ray Dalio substantially reduced their exposure to Fixed Income. Apparently not in reaction to the weak bond market of the second quarter, but instead as a result of many months of analysis which concluded bonds were no longer as attractive in a portfolio that’s expected to generate positive, uncorrelated returns most of the time. The classic justification for holding bonds is the diversification they provide to a heavy weighting in equities. It’s worked more often than not, but we may just be heading into a period of time that will test conventional wisdom. To start with, yields on high grade and government bonds are unattractive on a buy and hold basis. It’ll be hard to finish ahead of taxes and inflation with yields of 2-3%. The idea that bonds will rally during times of equity market stress, thus mitigating the inevitable mark to market swings of a conventionally allocated portfolio only seems to justify bonds if you’d actually sell them when they’re bid up through a flight to quality. Few investors do, and the ownership of bonds for the temporary sugar high that turmoil may bring seems less interesting when the long term prospects are poor. Watch for creative explanations from financial advisors to defend clients’ bond holdings in the future. But the other side of things is that stocks and bonds may at times be highly correlated on the downside. If the Fed’s attempts to at least slow the growth of its $3.5 trillion balance sheet awake the sleeping child, or perhaps even result in a smashed dinner set all over the floor, weaker stocks may be accompanied if not even caused by weaker bonds. The flight to quality may not work. We believe the most likely outcome is one of very measured, non-threatening reductions in Quantitative Easing and a further very long interval until short term rates rise. This is what the Fed has told us to expect. But that’s just a forecast, and we could be wrong. However, if we do find ourselves in a substantially weaker equity market caused by the Fed’s lack of manual dexterity, we at least won’t have compounded the error by owning bonds as well. This is the title of a “mini-book” by William Bernstein. I just came across a review of it by Larry Swedroe. I haven’t yet read Mr. Bernstein’s book (I just ordered it this morning) but Swedroe’s review caught my attention. It looks as if a three factor analysis of hedge fund returns has arrived at the same conclusion I did in my book – that hedge funds used to be great, that early investors did well, and that the industry today is overcapitalized. David Hsieh, Professor of Finance at Duke’s Fuqua School of Business suggested that alpha is finite, and that’s why today’s hedge fund investors will continue to be disappointed. Makes perfect sense to me. So now we have some real academics weighing in on the debate, as opposed to the pseudo-variety hired and paid for by AIMA in London. Mediocre returns delivered at great expense continue, providing additional support for the critics. Hewlett Packard (HPQ), a company that is earning records for large and expensive strategic errors, plummeted to new depths of incompetence today with their $8.8 BN write down of Autonomy, a software company they acquired in 2011. The list of enormous acquisitions about which nothing much positive subsequently emerged is shockingly long: Compaq in May 2002 for $25 BN; P&G IT in 2003 for $3BN; Mercury Interactive in 2006 for $4.5BN; Opsware in 2007 for $1.6BN; Electronic Data Systems in 2008 for $13.9BN; 3Com for $2.7BN, Palm for $1.2BN, 3PAR for $2.35BN and ArcSight for $1.5BN all in 2010; Autonomy for $11BN in 2011. And these are just the $1Bn or greater deals. $66.75BN in acquisitions over the past ten years and the company’s market cap is less than half of that. None of today’s board members have served since 2002, but several joined in 2009 since when HPQ has spent $18.75BN including on the ill-fated Autonomy deal. Among those board members who have been around long enough to be responsible are G Kennedy Thompson and John Hammergren (both since 2005), and Marc Andreessen and Rajiv Gupta (both since 2009). There are only eleven board members including CEO Meg Whitman, and she was on the Board when they bought Autonomy prior to becoming CEO. When you write a check for $11BN and subsequently find you were ripped off, you can’t seriously blame anyone but yourselves. Pointing the finger at the former management of Autonomy or the auditor just further confirms that none of these people should be managing anybody’s money but their own. For our part, while we’re thankful to have never been investors, we’re going to add the HPQ Rule to our investment process that rejects any investment in a company with one of these value destroyers on its board of directors. The Fiscal Cliff is forecast to represent 2.9% of GDP drag in 2013 if nothing is done, according to the Congressional Budget Office (CBO). Although it was originally intended as a mechanism to force Congressional compromise around bringing the Federal budget under control, with less than seven weeks until the automatic tax hikes and spending cuts take effect the focus is now clearly on simply avoiding the blunt instrument of fiscal policy that it represents. The CBO’s analysis breaks down the different pieces of the Cliff and calculates the impact of each on GDP. Assessing the likelihood of compromise on each one provides an interesting perspective on the likely resolution. 1) Raise Taxes on the Rich – this has received the most attention by far. The President wants to raise taxes on those single tax filers making more than $200,000 and joint filers making more than $250,000. The Republicans will likely agree to higher taxes in some form. That will be one consequence of their poor showing in the election. “Rich” may eventually be defined as income above $500,000 or even higher, but it really doesn’t matter. That’s because the CBO estimates that even if tax rates for this group were restored to their “pre-Bush” level and investment income was all taxed as ordinary income, the entire impact would be to slow GDP by 0.1%. The optics matter because the “shared sacrifice” that must ultimately include entitlement reform can only occur in conjunction with some sacrifice from the 2% or 1% (depending on the definition of “Rich”). The Republicans have already indicated some flexibility on their opposition to new taxes so while it will grab headlines, wherever they ultimately settle on this issue it won’t impact the economy much. 2) Allow the temporary reduction in the payroll tax and emergency unemployment benefits to lapse. This is probably going to happen – neither party has expressed much interest in extending these. The CBO believes this is worth 0.7% to 2013 GDP. So now we have 0.8% of fiscal drag already imposed on the economy, as well as the effects of Hurricane Sandy (estimated to cost 0.5% during the current quarter). Let’s look at the remaining components of the Cliff as measured by the CBO. 3) Restore the pre-Bush tax rates on everybody else. This is worth 1.3%. The Republicans are against this, and the President has focused on raising taxes on the rich. How hard are the Democrats really going to push to raise taxes on the middle class under these circumstance? It’s likely both sides will agree to defer this item. 4) Automatic cuts in Defence, 0.4%. A complete non-starter. 5) Automatic cuts in non-Defence Discretionary spending, 0.4%. There’s some room for symbolic cuts to remain, by way of demonstrating resolve, but it’s unlikely to be close to this figure. The beauty of the Cliff is Congress created it and Congress can alter it. Neither side is likely to find much benefit in causing more GDP drag than the 0.8% or so illustrated above. So having decided they’ve done enough, or made a “down payment” as John Boehner has said, the Cliff will be avoided. The announced settlement will include a commitment to a broad-based overhaul of the budget and perhaps tax reform, to be negotiated in 2013. Will they include another Fiscal Cliff by way of forcing Congressional action? Possibly, although the President will undoubtedly push back on that. Under different circumstances during these negotiations the President and Congressional leaders would be maintaining a watchful eye on the bond market for its approval of fiscal discipline, and to a lesser degree the rating agencies. Except that, as a barometer of such things the Bond market no longer works. The Federal Reserve is by far the biggest buyer of bonds and since they’re not economically motivated interest rates won’t be allowed to respond by voting on the outcome. Perhaps the most powerful visible incentive on budget makers to negotiate difficult compromises will be silent at this time. As such, the motivating features for both sides will be contemplating the visible cost of fiscal drag through tough decisions without the benefit of lower borrowing costs for the government or the penalty of higher costs if action is insufficient. Equity investors are enduring a difficult time right now, and that may continue through year-end. However, it seems likely that a fairly modest GDP headwind and catastrophe avoided will be where we ultimately wind up. We can all wring our hands about the long term cost of such an approach, but take the world as you find it. We continue to own solid businesses with good prospects and strong balance sheets that will be around no matter what happens, because we’re probably going to see another can kicked down the road. We like Microsoft (MSFT) whose cashflow generation continues and is priced at an attractive less than 7X FY June 2013 EPS ex-cash; Berkshire Hathaway (BRK-B), which at under $85 is close to levels at which they could buy back stock (as much as 10% above $76.29 book value, or $83.92). We recently added to Kraft Foods Group (KRFT) which yields almost 4.5% and will comfortably cover its $2 dividend with $2.60 of EPS next year. Following a good earnings report we sold Energizer Holdings (ENR) since the battery business is shrinking by a startling 7% per annum and they’re likely to have to cut pricing to stay competitive which will hurt their margins. And we maintain an investment in the Gold Miners ETF (GDX) since reflation is where central banks are going and Europe is demonstrating the futility of too much fiscal discipline too soon. Timing is invariably difficult, but it’s possible to see a negotiated solution that can turn out fine even if it once again delays the day of reckoning. For investors, 2012 has been a year so far of disasters that did not occur. The Euro did not implode; Greece was not unceremoniously dumped out; Israel has not attacked Iran; and other perhaps even less likely mishaps did not occur. Consequently, it’s been a good year for equity investors if you had the long term view or short term intestinal fortitude to remain invested. But it seems to me that the next looming disaster, the “fiscal cliff” may not be so easily avoided. Corporations are increasingly voicing concern about slowing demand. Anecdotal evidence is that uncertainty related to the election and its immediate aftermath are causing many spending decisions to be put on hold. And it seems 3Q corporate profits, whether they were surprisingly good or not have included downward revisions to guidance more often than in the past. Meanwhile, conventional wisdom is that after the election legislators in Washington will arrive at a compromise that avoids the worst of the immediate drag on the economy from higher taxes and spending cuts that current law dictates. The idea behind this structure was that it would force Congress to address the issue rather than submit to the blunt instrument of sequestration. Although many people seem optimistic that a solution will be found, I don’t think it’s so simple. First of all, the election is intended to clarify popular opinion with respect to each party’s preferred solution (i.e. will we solve the problem with more cuts and less tax hikes or vice versa). And yet, the most likely electoral result is that Obama wins, the House remains Republican and the Senate is controlled by neither party (where a 60-vote filibuster-proof majority is required to push through contentious legislation). Don’t be confused by the various national polls – Intrade (where people bet money on the outcome) shows Obama with a 62% probability of winning (versus 38% for Romney). It may well come down to Ohio, and Romney’s improvement in national opinion polls isn’t nearly as important as what the people of Ohio think. Romney is not ahead in Ohio. So there’s a reasonable chance that the Lame Duck session of Congress that will meet following the election (for only 12 scheduled days until January) will be approximately the same group to be sworn in to power early next year. This is the same group of legislators who almost took us over the precipice in the Summer of 2011 with the debt ceiling mess. The notion that the losing party will respect the popular mandate and make more of the concessions necessary to avoid the cliff seems fanciful. More likely is that the Republicans will claim that a weak Presidential candidate not truly loved by the rank and file failed to capitalize on the widespread unhappiness with Obama. Moreover, they’ll have little incentive to compromise because it’s not their economy. A 2013 recession might be the best way to start the fight for 2014 mid-term elections, from the Republicans point of view. But whether you accept that analysis or not, consider that neither side will want to settle things until the last possible minute, for fear of foregoing the best available deal usually obtained through brinkmanship. Two or three extra weeks of bargaining in hope of a better political outcome will seem worth the possible short term economic damage. They’ll work something out in the end. There’s little choice. But my bet is that between now and December 31 there will be moments when there’s reason to doubt that optimistic outcome, and in any event the economic damage caused by uncertainty is being inflicted every day. How to invest through that period? We continue to own equities we like, but have trimmed positions in names that we believe are highly cyclical and hold some cash in case we are able to invest in one or two businesses at better prices than are available today. In our Deep Value Equity strategy one of our biggest positions is Berkshire Hathaway (BRK-A) which is attractively priced and not likely to cause too much concern even in the dark days of late December. We also have a big position in Microsoft (MSFT) – the release of Windows 8 looks underwhelming but its valuation and monopoly-like positions limit the downside in our opinion. The Gold Miners ETF (GDX) is a bet on central bank reflation and it’s been handily outperforming the S&P500 of late. And Corrections Corp (CXW) should reveal more about their REIT conversion in a couple of weeks. Natural gas is +6% today, in part no doubt because stocks are being rebuilt at slightly faster than over the past five years, according to the Energy Information Agency (EIA). Of course a mild winter like last year will lead to another excess of supply, although the continued switching from coal to gas in energy production is leading to a permanently higher level of underlying demand. As a result, many natural gas names including Range Resources (RRC) and Comstock Resources (CRK), both of which we own in our Deep Value Equity strategy, are higher today. In addition, Bernstein Research initiated coverage on RRC with a buy recommendation. RRC claims potential resources of up to 60 TCF (Trillion Cubic Feet), enough to supply the U.S. for almost three years. The capex requirements to exploit a fraction of this are beyond RRC’s current capability which is why we think ultimately they’ll be acquired by a far larger company. However, BHP Billiton bought Petrohawk last year for $12.1BN and just recently had to take a $3.3Bn writedown on assets predominantly including natural gas. So other potential acquirers may be cautious about overpaying for assets in what is likely to remain a well supplied domestic natural gas market for the foreseeable future. Nonetheless, a price closer to $4 per MCF rather than $3 seems likely over the long run given where the fully-loaded marginal cost of production is, and low cost producers such as RRC should be able to continue their production growth under those circumstances. Last night’s event organized by Catalyst Financial Partners was a great success. I was paired in a debate with an old friend Peter Fell, with whom I traded interest rate swaps back in the 80s when we were both at Manufacturers Hanover Trust (Manny Hanny). The question posed was “The Eroding Profitabilty of Hedge Funds”. Peter (now with Kenmar) gamely took what I felt to be the much harder side (i.e. defending the hedge fund industry) and it was capably moderated by Brenda Mauro of Trident Fund Services. Peter was not distracted by the autographed copy of my book that I shamelessly thrust into his hands moments before we began, and while there may be varying opinions on the future of hedge funds most would agree that investors will need better terms and results if the industry is to prosper. Today KPMG released a report on hedge funds in partnership with AIMA, the UK-based hedge fund lobbying group. They evidently felt moved to set the record straight after the relentless battering hedge funds have received in the financial media of late. I am grateful that they have made such an effort – it’s given me something to write about. The Euro has been a good hedge on a portfolio of long stock recently. Equities are attractively valued for a long-term investment; the equity risk premium remains high. But who can think about investing in stocks for the long run and shunning bonds when the Euro sovereign debt crisis rolls on. 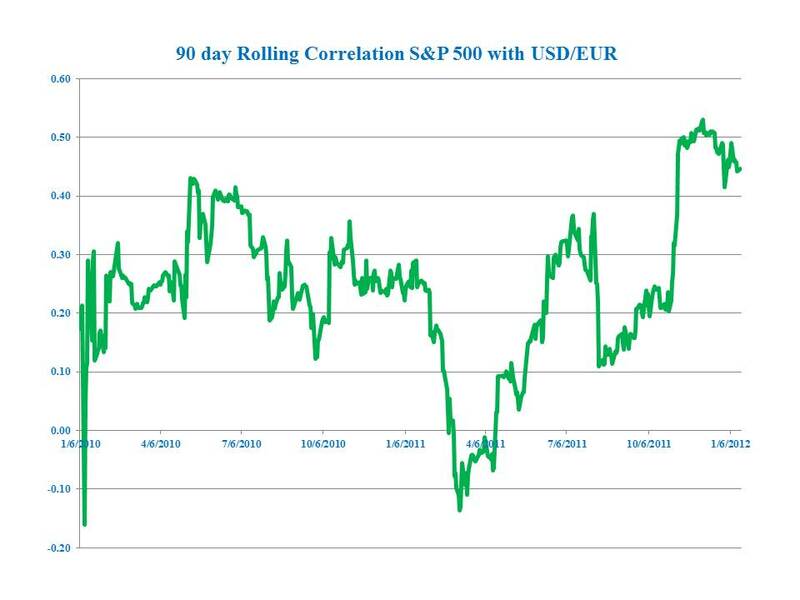 For us, the solution was to short the Euro as a hedge against long equity positions. The correlation between the two rose during 4Q11, not surprisingly since Europe was driving short-term market moves. But the ECB’s Long Term Repo Operation committed them to support the banks and, by extension the Euro sovereign governments (barring possibly Greece, which is heading down its own path). Since Europe’s banks are the biggest holders of European sovereign debt, the ECB has in effect become a lender of last resort to its governments. The removal of the Sword of Damocles hanging over markets has been replaced with a more plausible path to a lower Euro. Europe is in recession, the GDP differential between it and the U.S. is likely to exceed 3% this year, and the next move in rates from the ECB is likely down. Meanwhile, the U.S. economy continues to produce steady if unspectacular growth. It’s still worth holding a short Euro with a long equities position. The tail risk, an unforeseen crisis in Europe, still makes it a worthwhile hedge even while the day-to-day relationship has become slightly more subdued. But they could just both be good investments in their own right. Equities are attractively priced and the threat of a European crisis is receding. The Euro area is in for a period of no-growth while banks recapitalize and governments impose austerity. Long equities and short Euro is not the pairs trade it was, but both look like attractive investments. It’s taken many observers including me longer than it might to comprehend, but ECB chairman Mario Draghi has done something that should be very bullish for U.S. stocks. Floyd Norris noted some of the ramifications in today’s New York Times. The Long Term Repurchase Operation (LTRO) in effect is an extension of credit from the ECB to EU sovereigns. How can this be, when Mr. Draghi said all along he would not lend directly to governments? Because of the symbiotic relationship that exists between EU governments and their banks. The banks own most of the debt. If the banks can’t afford to roll over maturing bonds governments will default. If governments default banks will go with them. Both are locked together, and we believed that the ECB was holding off from proving needed sustenance while the politicians showed some evidence of imposing fiscal austerity. They (sort of) did at the last summit, and now the ECB has taken a path from which it will be difficult to turn. Eurozone banks took down 489 billion Euros of three year loans at 1% this week. Whether they choose to buy sovereign debt or not is really not the point. They can, and now whenever the banks appear sufficiently shaky that they won’t be able to finance what their sovereigns need, the ECB can be relied upon to provide it. There will no doubt be more brinkmanship and dire warnings about delaying needed economic reforms in the south, but the problem has always been the absence of a credible punishment to wavering countries. The Maastricht Treaty incorporated enormous fees (1% of a country’s GDP) that were soon shown to be implausible when Germany and France were among the first to breach the 3% deficit/GDP criteria. Forcing a country to default is clearly unacceptable. The Eurozone’s countries are all roped together, and the ECB recognizes that pushing one off the cliff endangers them all. The ECB is the lender of last resort to banks. It has become the lender of last resort to EU governments as well, and Germany as a guarantor of the ECB’s balance sheet is now part of this solution. This is not necessarily bullish for the Euro, although the tail risk of a disorderly collapse has been removed. But it is assuredly bullish for U.S. equities. By far the single biggest question mark hanging over stocks has been Europe, and now the roped-together have stepped away from the cliff. Equities are attractively priced compared with bonds and have been for some time. This may just be the development that nudges investors off the fence.